That's me to the left there! That was pretty amazing. You can actually sort of see it is me in this zoomed & cropped image. The full full image (higher res). At the bottom of this page you can see why I call this an 11 foot wave. 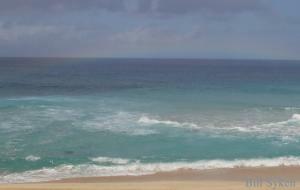 This year, the gods were willing, I DID participate in the Pipeline Bodysurfing Contest. Great photos from 2003. I used to think I needed to do it before I hit 45, but, now I think I can do it for a few more years - provided I train for 3 months! This personal account is still a little rough. The Tofu Gang story. Let's start with Contest web site. Sports Illustrated article written by Bill Syken. RIGHT: James Duca or Mark Cunningham in the bigest wave of the day. Gwenael LeFranc had a great quarter final heat. LeFranc in front of a good sized wave. David Love in the curl. 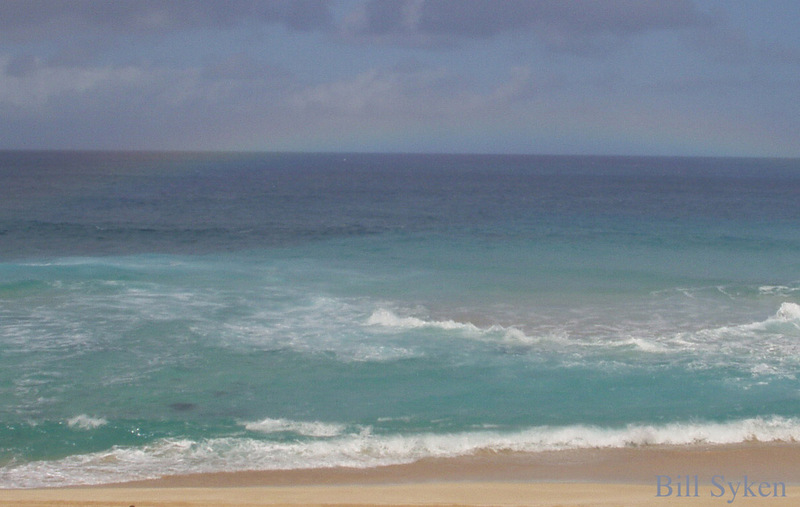 This rainbow is between us and the waves - actually this one is basically on the beach. It is very faint, but, you can see the water behind it. Very cool to see people out at Pipe THRU a rainbow. There is always controversy in estimating wave heights. So, I wanted to be a little conservative, but, not leave too much out. So, I claim the wave is over 11 feet. The contest report says waves were 3-5 feet - HAWAIIAN, which means you need to double that to get the face heights. So, larger sets would come in. I believe that the wave up top is somewhere around 15 feet. 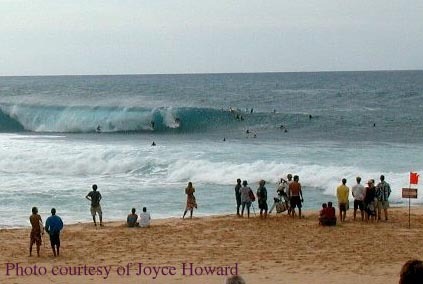 If the waves are of any size there is a flock out at pipeline. When I was there, it seemed that there were usually about 50 people. This picture shows a few. There are even more right behind the breaking wave. Out of the 50 there are about 20+ board surfers, aka sticks, 25+ body/boogie boards, aka sponges and during the contest five or more bodysurfers. Since the surfboards have the most glide, they can be the first on the wave. Bodyboarders are next. Only if there are no surfers or bodyboarders can a bodysurfer take the wave.